Bookcase (Toughness: 5) - Slow and sinking, just like many other big enemies. However, it releases books which are excellent flyers and are a big threat to Espers up above (and otherwise). Behind a heavy door, not far from the start. There are some ? boxes around for score adjustment. There's a bookcase too, but its toughness makes it rather time-consuming to adjust score with unless one has the P power. A good alternative is to hit the bookcase (with Genzoh or Bunta) or the umbrella in the starting room down below. Concealed walls block the way from above, but you can enter by breaking your way through a false floor from below. If you haven't got Genzoh yet, you'll get him here. Otherwise, you'll get a Magical Bonus. The bookcase in the starting room is quite dangerous. Leaving some food pots as foothold allows you to get out of this room without having to use the moving box on the right. Exit this room as Akiko, in preperation for the coming rooms. Her jump is barely enough to leave; make sure that you are holding "up" on the joystick all the way. 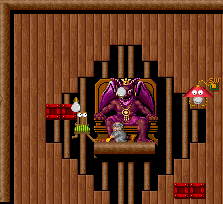 The bookcase in the area above can be banished by hovering in the magic spot to its upper left. The rest of the scene is rather straightforward. 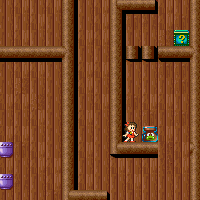 The next two rooms with food pots are basically Akiko's areas. Be careful of books. 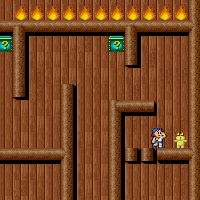 (The two fires in the lower right corner of the second room are false, but there isn't much need to go there.) Change into Bunta at the next telephone booth, and change into Genzoh at the last one. You should have Genzoh by now. Using him, this Satan should be no problem. Making good use of break points, the All Gold Bonus in scene 5 is quite easy to get. Start with Genzoh if you have him. (Yet another reason why you should get Genzoh by scene 4!) Get the first 3 sets of 15 foods, leaving some food pots near the exit. (If you need to destroy a bookcase, try to do it with a hammering which also opens a food pot on the floor.) 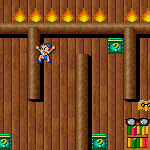 At the break point, adjust your score for the Secret Bonus with the bookcase here, then change into Naoki and climb up. Use the magic spot to banish the bookcase above, get the Secret Bonus and other ? boxes, then come back and get the remaining 6 food pots and change to Akiko. Keeping a modulus 3 count, get the Magical Bonus, then finish the set in the bottom room. Stop at the break point and hover to the far left to get the Time UP and deploy icons. Come back and get the remaining food pots, then keep a modulus 2 count until you finish the set in the next room beyond the next ON gate. This leaves only one set. If you don't have Genzoh to start with, you may start with Makoto instead, and at the start immediately jump up from a food pot to the area with the ? boxes above. 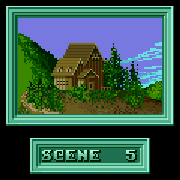 This banishes the bookcase, but it will make it less easy for you to adjust score for the Secret Bonus. If you don't have the P power, you should do it by hitting the umbrella with Akiko, rather than hitting the bookcase above with a kid. When you return to the starting room after getting the Secret Bonus, if you are getting the set of 15 Strawberries, you should be careful in the bottom room, because 15 is an odd number. When you hammer at an altitude between two containers, you'll hit the top one first, but when you move in, you'll get the bottom food first. This will disrupt the Gold Bonus. To deal with this problem, after picking up the 14th Strawberry, you should lower your altitude so that you hit only the lower pot. This page was last edited on 13 December 2010, at 20:39.